I think I may have stumbled across the best chocolatey dessert/snack ever. It's from the same lady as the Life Changing Loaf of Bread, and I think this might just be in that same category. It's the Raw Brownie from Sarah Britton of My New Roots. I've been trying to minimise refined sugar for a while now, so I'm always excited to add to my repertoire of sweet things that are made of good, healthy ingredients. I guess the goal is to cut down on desserts overall, but making sweet treats out of real food ingredients rather than fake, manufactured crap is a good transition step. And more realistic for someone like me with a pretty good sweet tooth. These brownies are a delight. They only have five ingredients: walnuts, almonds, cacao powder, sea salt and dates. Six if you sub with a few prunes like I did. They're pretty hard on the blender. I overheated my Vitamix twice and it stopped working for a bit, which was a bit of a worry, but eventually I realised it hadn't completely died, and it was just a failsafe mechanism in action. Phew. 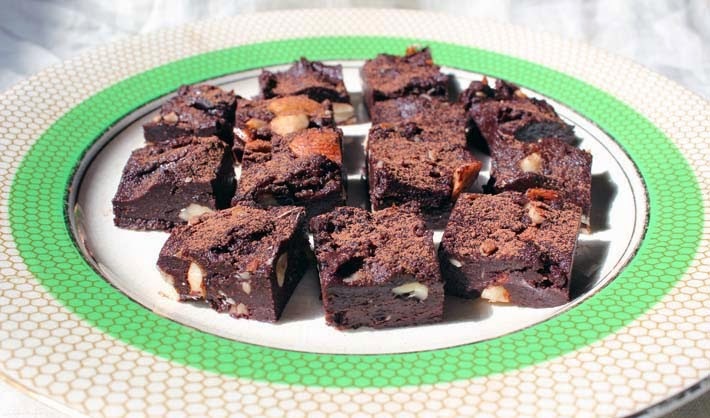 So basically, you just whiz all the ingredients together until they form a fudge-like consistency, aside from the almonds, which you just roughly chop. Mix it all up together and press into a baking tray and freeze to set. Then just cut into small cubes and try not to eat too many at once. And judging by the hundreds of comments, they're obviously a hit with others as well. And if you want to feel even better about it, read Sarah's description of all of the health benefits of the ingredients. I had a laugh about how she cannot accept any marriage proposals (as thanks for this life changing recipe) because she's already taken. Apparently Sarah Britton has a cookbook in production, which I'm pretty excited about. The photos on her blog make you want to crack out the kale and green peas, so I'm sure the cookbook will be something to behold. I just noticed a recipe there for raw chocolate too, that's going to be next off the block! Looks delicious! I have to try that recipe. Thanks a lot for sharing.